CST Week is Here: Go Time | Tales of Adequacy! Do it yourself giant mecha. The theme of this year’s API goal. 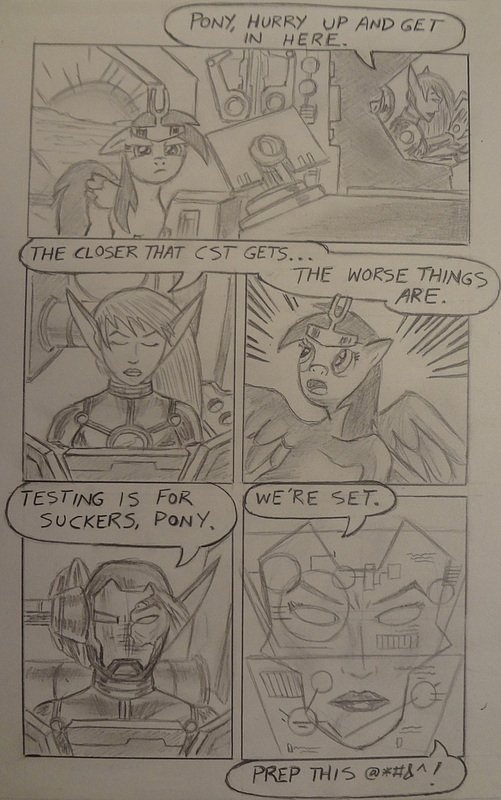 So Pony and our hero have been working on a Do It Yourself Kit, instead of a teamwork based Voltron. That theme came up pretty clearly in our IDT meeting, when my co-teacher asked for everyone to exchange their lists of ideas for improving teamwork in the group of teachers. All of mine were real luddite theories, with old school bulletin boards, and a file with sample content sorted by date, so we could all share materials easily. Rotating responsibilities, to lighten the load, and so forth. They took up the front and back of a slice of paper, because I outlined how each would work. I wouldn’t take that excuse from my students. My history teacher stormed out, pissed. As she should have. The rest of the “team” more or less pounced, and I needed to straighten that out. Pronouncements of hurt feelings were made, of invalidation of ideas and so forth, and it was all, at the end, very tiresome. All week long I’ve been swapping my class time between simulated CST exams to desensitize my students to it, as well as gather a predictive data set, and doing collaborative work with the Science Teacher. in other words, gearing up for the test, and making sure my kids do well in other classes. No one returns that favor. That’s why my history teacher walked, and she should have. We need, as adults, to be able to work together in a way that is mature, and about the job. The next day, we had one of our few assemblies of the year. Of course, it was about the CST, and was supposed to be motivational. Cheerleaders, musical performances, even a video that my History Teacher and I appeared in. She rapped about the CST, with Administrators as back up dancers, while I pretty much shouted my lines to music, while looking mean and holding a giant Rainbow Dash “My Little Pony”, which was dressed like me. (This has a lot to do with why Pony is a character…brought in to motivate for the CST). Amazingly, the kids ROARED and made an ovation when they saw us do our parts. We are pretty strict, mean teachers, but not taking yourself seriously, for about a minute, and being part of the fun…that’s all they want. Sadly, our other teachers could have been in the video too, and started building that kind of weird student teacher rapport, but things like, “I’d be embarrassed,” or “I don’t want it on YouTube or anything,” were said. One of those lines from a teacher who expects her kids to perform, and video a play in two weeks. It would have made her assignment much easier if she had stepped down to the student level for just a moment. Taken the same risk she asks them. As of this week, with minimal teamwork, my own mecha seems to be working okay. We are good for launch next week, starting on Tuesday. Next week is a big week for Adequacy, as we are hitting the No. 400 post! I’m very excited about it, and have been working on a Bill Sincewecz style piece of art, adapted from one of my favorite single issues of all time, just to celebrate. I am dreading coloring it. I have to be ready for Tuesday’s post though, or be like modern comics creators, and not deliver on time. On Monday…When Cosmic Titans Meet!